When you want to watch some great streaming video, where do you go? Netflix, perhaps? Amazon Video? There are fantastic original shows from both these titans. Now, what if you’d like a similar, quality video experience for your virtual reality headset? Sure, there are many apps out there that pull together some great, and not so great, VR videos. But there’s no guarantee of quality, and no single destination to visit where you’ll always find something amazing, cool, and new to watch. That’s where Inception VR comes in. It wants to bring everything that makes Netflix, HBO, and Amazon Video great to the world of VR. “We want to create VR content that’s engaging, something special, and tell stories in a way that’s only possible in VR,” co-founder and CEO Benny Arbel told Digital Trends, when we got an early demonstration of Inception’s VR platform. We saw two — an immersive tour of Salvador Dali’s incredible art, and an original, trippy, special effects-packed DJ set shot in Ibiza. The latter was a world first, shot using Nokia’s ultra high-tech Ozo camera rig. It mixes footage specially recorded at a packed club in Ibiza, with digitally added effects of an alien invasion. Yes, really. However, it’s all blissed out in the way you’d expect a sweaty Ibiza club to be, so they’re friendly aliens that want to party, too. Colors, shapes, and abstract patterns match the beat of the music, creating an intense visual accompaniment to the dancers and audio. It’s also interactive, so you can select different rooms and viewpoints, or different dancers and stages, to find the club experience that’s right for you. What does it mean to create the best VR film? “We wanted the best,” explained Kevin Malloy, Head of Production at Inception, about the decision to use the Ozo. It excels at low light and close-up VR recording, and provides the best auto-stitching and real-time preview features available at the moment. The Inception team wants to produce a similar DJ video each week. Obviously, psychedelic videos like this won’t be for everyone. The Salvador Dali art tour takes the viewer inside his most famous paintings, blending the art with the real-life inspiration for the pictures perfectly, and providing background on the history and significance through a voice-over. And Inception say it’s just the start. For example, a partnership with London magazine Time Out will take you behind the scenes and into the dressing room of the musical Wicked. Malloy also talked about its partnership with Time Out, which could see users exploring London’s best burger joints. Elsewhere, Inception VR could host everything from a interactive behind-the-scenes tour with the Mystery Jets band, to virtual reality workout classes. To that end, Inception has hired specialist tech personnel, visual effects experts, VR directors, and has put the Emmy-award winning producer of Homeland — Ran Telem — in charge of content. Facebook Client Council member Gigi Levy is also onboard as co-founder and investor, and given Facebook’s obvious interest in virtual reality, he’s a good ally to have. In addition to Inception’s own original content, content aggregators will pull together the best VR movies, short films, and more into curated lists, or place them into a series of channels divided up by publisher or distributor. The potential is there for Inception to be the place for filmmakers to premiere their VR movies, or for film festivals to curate their own sections to show nominated VR entries. Inception is wary of how brand-driven video could take over, and potentially ruin the overall experience. 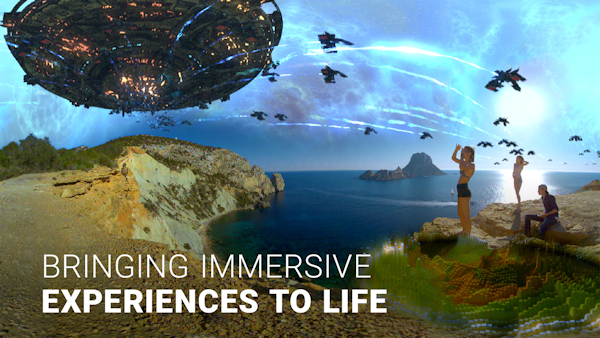 It’s not seeking out brand-driven content, and says it won’t be a “branding machine,” but if a brand makes a stunning VR video, and provided the message doesn’t overwhelm it or drive the narrative, it may still find a place in Inception’s library. Inception’s focus will always be on quality, and providing the best overall experience. Inception’s VR video platform launches today with around 20 different videos to enjoy, all of which are free — but expect pay-per-view experiences to come in the future. A heavy subscription model is unlikely to come though, thanks to investment from the hardware and software companies that want people watching VR in the first place. Best of all, Inception is cross-platform, and works now on the Gear VR, Oculus Rift and Google Cardboard, with HTC Vive and Playstation VR to follow soon. Google Daydream, for which there will be a major marketing and awareness push, will also join them. From this year on, more and more people will have the opportunity to wear a VR headset, and are going to need something good to watch. Inception wants to be the number one destination for great VR video, and is highly motivated to be there right at the start. From what we’ve seen and heard, it’s taking exactly the right approach. Check out the app here.